Space engineers have set up the rocket which will carry the Olympic flame to the International Space Station from the Baikonur Cosmodrome. 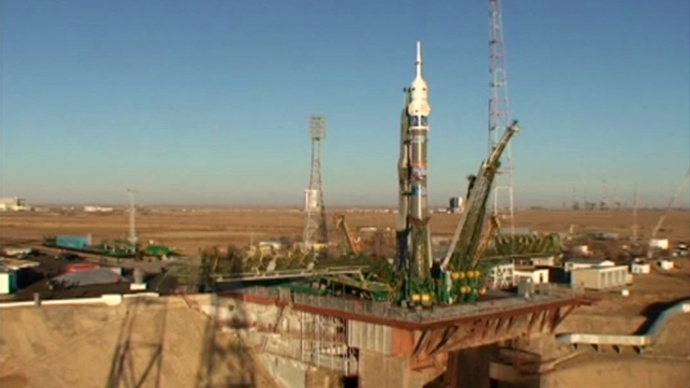 The launch of Soyuz TMA-11M is scheduled for Thursday. The Soyuz spacecraft will be boosted by a Soyuz-FG rocket from the first launch pad of the Cosmodrome, the so-called Gagarin’s Start. 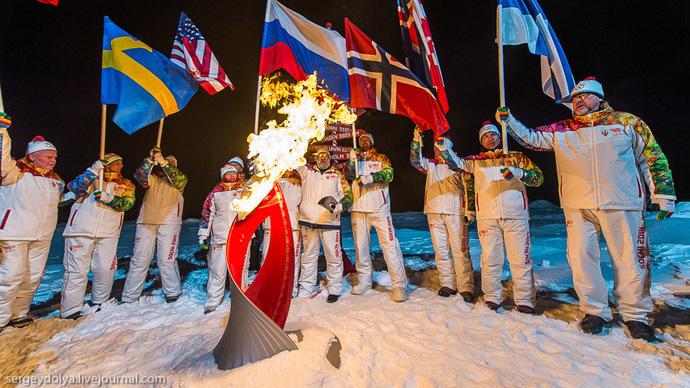 It will be the first-ever delivery of an Olympic flame into space. To mark its unusual cargo, both the manned Soyuz and the rocket are decorated in Sochi Winter Olympics theme. The capsule carries the logo of the games, while the rocket was painted with a patchwork design, featuring traditional Russian images and patterns like the firebird and Gzhel designs. A torch flame is also shown on the mission patch. The three members of the ISS Expedition 38 who man the spaceship are Russia’s Mikhail Turin, NASA’s Richard Mastracchio and Japan’s Koichi Wakata. They all are veteran space explorers doing their third or fourth flights. The spacemen are to take part in the ongoing Olympic torch relay. 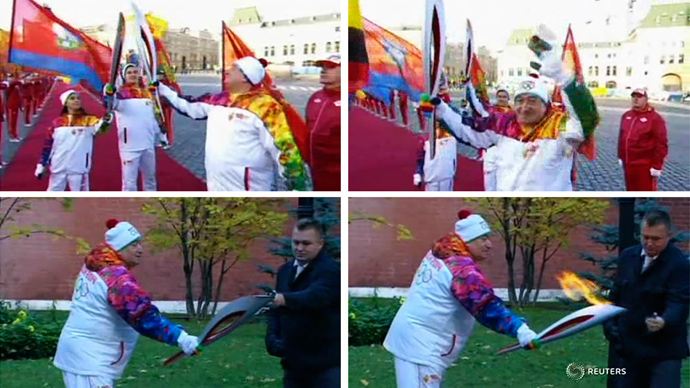 They will carry a burning Sochi Games torch from their hotel to the bus which will carry them to the launch site. The zero-G environment and safety measures required some compromises for the space leg of the torch relay. The flame will not be kept burning on the ISS as it would be prone to self-extinguishing, consume extra oxygen and pose a potential threat to the structure. But the torch will be carried all over the station modules and will be taken into open space during a spacewalk on Saturday. The space station has prepared for the arrival of the torch mission. Last Friday the current ISS crew undocked the Soyuz TMA-09M capsule from the Rassvet dock module and relocated it to the Zvezda service module. The dock is now free to receive the Soyuz TMA-11M. 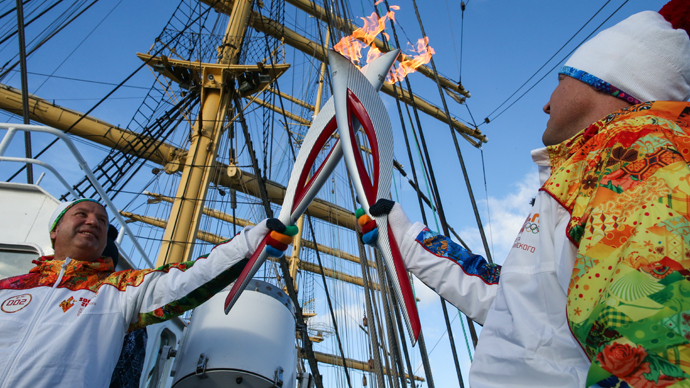 The Olympic torch is to spend five days in orbit. The Soyuz TMA-09M is to return it back home next week along with Fyodor Yurchikhin, Karen Nyberg and Luca Parmitano, who are currently working on the ISS.